CBBAG Alberta North chapter members, Janice Peters, Ros Schell and Rena Whistance-Smith and Carol Thomas-Bain participated in “Guilded”, a biennial exhibition on the theme of what’s “Around the block” which featured perspectives on their neighbourhoods, communities or scenes from their travels. The show, at the Art Gallery of St. Albert exhibited works from five artists’ guilds including work by former CBBAG member Barbara Pankratz. Alberta North’s Collaborative Project “Bound Together” was delayed 10 weeks due to three sets of pages damaged in printshop racks and will be drawing to a close mid-February. The group project is titled BOUND TOGETHER; a collection of 36 lino prints by 12 artists. Each participant chose three favourite subjects to illustrate, and provided a short description for each graphic. These were combined into individual eight page signatures along with an introduction and colophon. Each artist received one or more complete sets of signatures to bind in the order and style of their choice. “The Making of a Book” is a chapter project produced in conjunction with “Bound Together”. This is a step-by-step hands-on exhibit which encourages the exploration and appreciation of every aspect of creating an edition of a hand-printed artist book and includes tests, proofs and planning materials along with photographs of the printshop, presses and work in progress through several stages. This will be added to our library box for community outreach events. The photo below shows demo and proof prints from “Bound Together” beside a small platen press. Solid black areas are difficult to print on a letterpress and the teacup shown had many areas of “salty” printing before the makeready was completed. Ros Schell and Dawn Woolsey of the CBBAG Alberta North chapter and Tina Cho, former member, were invited to participate in the first annual Artisan’s show and sale at the new Wellspring facility in South Edmonton. Wellspring offers non-medical therapy for cancer patients, families, caregivers and bereaved. Dawn and Tina are working with a counsellor to develop an art program for early 2019. Janice Peters of the CBBAG Alberta North chapter prepared an exhibition of handmade books at the St. Albert Public Library, featuring a collection of old and new structures from the members’ annual exchange. Dawn Woolsey of the CBBAG Alberta North chapter prepared a small collection of handmade books and boxes for a one-day exhibition on behalf of the Chapter at the Paint Spot’s Atelier studios in conjunction with an art-talk and paper presentation by Paula Huisman from the Japanese Paper Place in Toronto. Dawn Woolsey of the CBBAG Alberta North chapter taught a weekend workshop, ‘Introduction to Letterpress” at the SNAP printshop. The workshop covered letterpress printing basics from start to finish and an introduction to Lino printing including typesetting by hand, inking, locking up and pulling an edition of one-colour prints on Vandercook and Challenge cylinder presses. Dawn Woolsey of the CBBAG Alberta North chapter conducted an information workshop for Word and Image students in the University of Alberta Fine Arts printmaking department and displayed books from the Chapter’s library exhibition box for participants to examine. Demos included making adhesives, determining paper grain, folding and piercing signatures, pamphlet sewing, covering boards, side stab text block preparation and bindings, fishbone fold, star books, and concertinas. Exhibition of handmade books at the St. Albert Public Library, featuring a collection of new structures with “Dimensional Covers” from the members’ annual exchange. More photos from our library exhibit in conjunction with the Art Walk in St. Albert in August. Exhibition of handmade books at the St. Albert Public Library, featuring a number of exciting new structures from the members’ annual exchange. “Miniatures and More” in the Gallery at Milner: A month-long exhibition of CBBAG Alberta North members’ handmade books in the Stanley Milner gallery exhibit space in downtown Edmonton, featuring a large collection of miniature books and boxes and books from the annual exchange where members were tasked with the challenge of creating a structure (with original content) they’d never built before. Inside the library proper, three exhibit cubes featured bound copies from our first collaborative project; hand-marbled paper, artists’ tools, hand-made boxes and more. 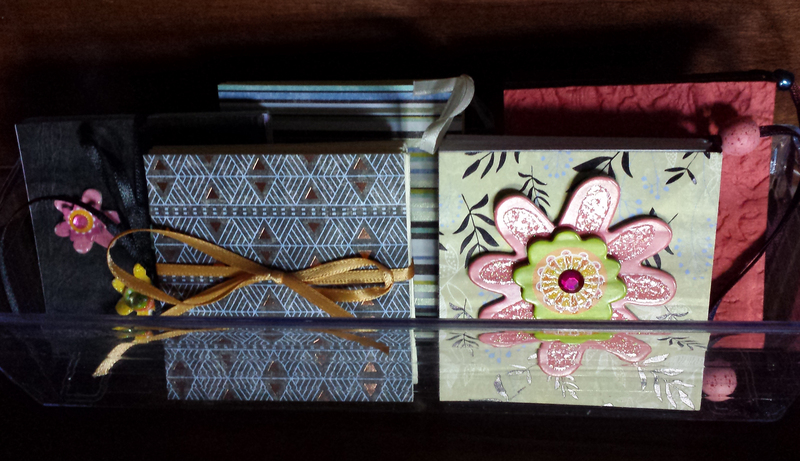 Exhibition of handmade books at the St. Albert Public Library, featuring miniature books. Rena Whistance-Smith of the Alberta North Chapter conducted a fast-paced coptic binding workshop assisted by Janice Peters and Dawn Woolsey. Exhibition of handmade books at the Gallery at Milner, the Stanley Milner library exhibit space in downtown Edmonton. The collection featured structures from the annual exchange challenge, previously unshown pieces from our Education collection, boxwork and marbled papers. Tina Cho and Dawn Woolsey offered a 2-hour workshop at the library offering two variations of a small origami book form. The Pulp Paper Pages exhibition at the Alberta Craft Council ran from April 14 – July 7, 2012. This juried exhibition was a joint project of the Alberta Craft Council and the Calgary and Alberta North chapters of CBBAG. It featured a wide variety of forms, objects, approaches, techniques and concepts found in both the paper and book arts. Several members of our chapter had works in the exhibition: Carla Costuros, Barb Johnston, Sara Norquay, Janice Peters and Ros Schell. Read reviews from the Edmonton Journal and the St. Albert Gazette. This exhibit was shown at the Leighton Art Centre Gallery, Calgary from June 8 – July 17, 2013. The artist reception took place June 15, 2013 from 2-4pm. The exhibition travelled to South Korea for the Wonju 2013 Hanji Paper Festival September 5 to 9, 2013. Wonju is formally twinned with Edmonton and Gangwon province has a similar agreement with Alberta. Wonju is the ancient centre of mulberry paper making in Korea and a modern centre for the hi-tech paper industry. The city of about 300,000 hosts a giant annual paper making festival that attracts a quarter million visitors. A small exhibit was set up at the entrance to the St. Albert Public Library for the May Art Walk. The exhibit ran April 25 – June 4 and featured 24 handmade books by 7 of our members: Barbara Johnston, Sara Norquay, Janice Peters, Ros Schell, Anna Szul, Rena Whistance-Smith and Dawn Woolsey. Strathcona County Library‘s ‘Learn @ Your library’ series in Sherwood Park offered two two-hour presentations on book topics: the first presentation by Sarah Mead-Willis of the Bruce Peel Special Collections Library focused on the history of the book. On February 12, 2012, Rena Whistance-Smith, Janice Peters and Tina Cho of the CBBAG Alberta North chapter covered the art and craft of handmade books and displayed books from the CBBAG touring program, A Book Arts Mosaic, for the audience to examine. An exhibition of handmade books was mounted in the Strathcona County Library from January 25 – February 28. A large window display case by the library entrance featured the pop-up books from our November 2011 book exchange. There were additional cases on the main floor and the upper floor. We reached a wide audience with our show at the Gallery at Milner, the Stanley Milner library exhibit space in downtown Edmonton, May 03-31, 2011. The Opening, Sale and Demo took place on Saturday May 7th, 2011. A one hour workshop, extended to two hours by popular demand, was offered by Tina Cho and Dawn Woolsey at the library the following weekend. 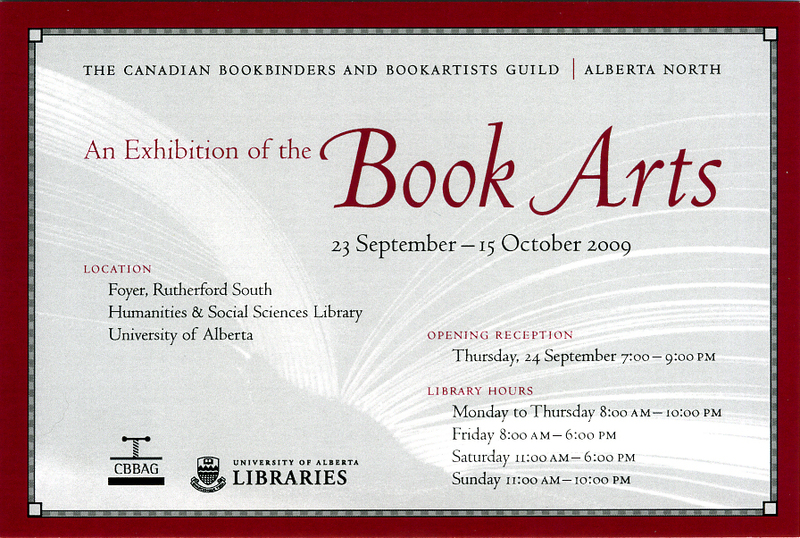 “About Books” (2010) was a popular exhibition in the Humanities and Social Sciences Library Foyer, Rutherford South on the University of Alberta main campus from October 4 – 31, 2010. Professor Steve Miller, visiting guest artist and Coordinator of the MFA in the Book Arts Program at the University of Alabama, gave two public presentations on book arts. Click on the invitation to see photographs of the exhibition. Click here to listen to a podcast of Prof. Steve Miller recorded in Rutherford Library in conversation with Barbara Johnston, Janice Peters and Rena Whistance-Smith for CBBAG Alberta North. This page has more information on each piece, including the artist’s name, title of the piece and a brief colophon.